Clubs that come "off the rack" may not be the right size and flexibility for you. Finding golf clubs that suit your game used to be simple. You walked into a sporting goods store, asked for your favorite brand of clubs, took a look at them and determined if you could afford them. If you could, you took a box of irons and a box of woods out of the store with you. Today, the process is not so simple, but the results are clubs that are fit for your swing. Visit a golf professional or professional club-fitter, who will measure your clubhead speed and will determine the lie angle and length. Tell the fitter about your game. Give him details like how long you have been playing, your handicap, your strengths and your weaknesses. Shorter clubs are easier to control, so if you are an inexperienced golfer, the fitter may suggest standard-length clubs even if you are taller than average. Let the fitter take your measurements. He will measure the distance between your wrists and the ground. Taller players don't necessarily need longer clubs because they are tall, and shorter players don't necessarily need smaller clubs. The distance between the golfer's hands and the ground is a key factor for the length of the clubs. 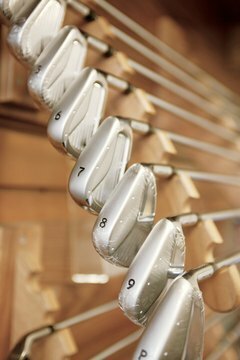 Try different clubs at the length the fitter recommends. Ultimately, the clubs should feel comfortable for you and produce results.